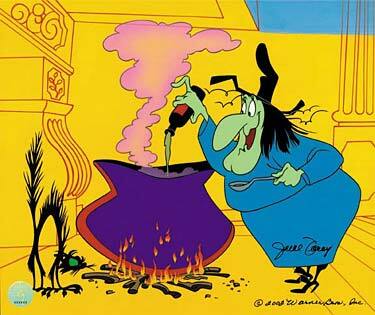 A German court has ordered a self-proclaimed witch to refund a disappointed client her hefty fee for a spell that failed to win back the woman’s partner. After her boyfriend left her in 2003, the client consulted the witch on a spell that would bring him back. Heâ€™s (Ken Mehlman’s–ed.) technically right about the campaign finance laws, which limit how much the national parties can directly spend on individual campaigns â€“ but which permit the parties to spend with unfettered abandon if they set up â€œindependentâ€ committees that operate without any oversight from the party overlords. But hereâ€™s the key point: Mehlman hired the person who in turn hired the person who produced the â€œindependentâ€ Tennessee ad. So even though Mehlman may have been officially in the dark about this specific ad, it strains credulity to believe that he didnâ€™t know what kind of ad his â€œindependentâ€ ad producer would create. Especially since this ad producer would not have been hired in the first place, to act â€œindependentlyâ€ and provide Mehlman with official deniability, unless he had been sanctioned by top GOP officials. ’nuff said. But I’m not stopping without saying too much. The issue here is not whether Ken Mehlman or any of his colleagues are bigots. Rather, the issue is that they are willing to harness bigotry to their cause. And, clearly, they are. While wrapping themselves in virtue. A sheet, dammit, is a sheet. Whether it comes from Target, Walmart, or Bloomingdale’s. It does not make for attractive wearing apparel. There’s plenty of it to go around, of course. But those who would wrap themselves in virtue should be careful to wear clean undies. With thanks to the Quotemaster. are, in short, a perfect match. interesting than the question of whether a submarine can swim. go into overload and blow up. This week, I have received two chain letters. Not emails. Real physical letters with, like, stamps and postmarks and return addresses and stuff. Someone is going to be very surprised . . . .
and it ain’t a-gonna be me. An Australian firm and its director have been fined a total of A$5.5m (Â£2.2m) after it was held responsible for sending out more than 230 million spam emails, 75 million of which were successfully delivered, during a two year spamming blitz. Wayne Mansfield, and his company Clarity1, of Perth in Western Australia, fell foul of the Spam Act 2003, which came into effect in April 2004. The court action stems from an April 2006 raid of Clarity1’s offices during which investigators seized computer equipment. Change-ringing bells rotate a full 360 degrees as they are rung and produce a shimmering, cascading sound quality in a complex, inexhaustible combination of changing tonal patterns. They are uniquely beautiful and require extensive training to ring. In preparation for the installation of the bells, the Trinity steeple will be appropriately reinforced with a new interior. Scaffolding is being erected as the work proceeds. The new bells, which range in weight from a few hundred pounds to over a ton, are currently being cast at the Taylor Foundry in the UK. I have never heard change-ringing, but I first heard of it here, in one of the best mystery stories ever written. Now that I have contacts in New York, I will make plans to hear the bells. Critics have accused (U. S. Envoy Alberto) Fernandez of not standing up for America in his comments aired last weekend by Al-Jazeera television, in which he said Washington had displayed “arrogance” and “stupidity” in Iraq. Fernandez issued a written apology the day after the Oct. 21 broadcast, saying he “seriously misspoke.” State Department spokesman Sean McCormack said Fernandez was still on the job and the matter was closed. It’s not fun. It’s not funny. It’s just cruel. And now a word about values. Values are not what you say. Values are what you do. I do know why, and it raises troubling questions about what we Americans owe the Iraqi people. What is our moral responsibility as it becomes clear that our bungled occupation has sunk Iraq into chaos – and that the country is approaching all-out civil war? My friend, call him George, is an Iraqi Christian, a middle-aged engineer who became a fixer for foreign journalists. He was my first Iraqi translator, and I was his first client. He called me “teach,” but he taught me more than I taught him. George lived in Amariyah, a Sunni neighborhood from which Shiite families have been expelled. Most shops closed after three supermarkets were bombed. George’s wife stopped attending church after a series of attacks on Christians and was afraid to go out without veiling. George had to keep his work secret lest he be killed. But the final blow came when he returned home one evening and saw a wounded man lying on the sidewalk in a pool of blood and trying to wave down help. George – like everyone else – was too scared to stop, lest he be shot for helping the victim. As he hesitated, a white Volkswagen pulled up, and a gunman fired three more bullets into the man, then sped off. Democracy on the march, no doubt. The benefits of staying the course. Oh, I forgot. No one ever said that. I have long wondered how the Republicans would behave if it became apparent, during the final sprint to election day, that they were truly in danger of losing the House or Senate or both. To borrow a cat analogy, if the Republicans felt cornered, how viciously would they bare their claws? Well, now we know. Just take a look at whatâ€™s happening these days in Tennessee. Basically, they’re suggesting that the black Democratic senatorial candidate should be defeated because he might be attractive to white women. The not-so-benign use of robo-calls is in doing anonymous hit pieces on candidates. Unlike TV and bulk mailings, campaigns are not required to list the sponsor of the call in non-federal races. Besides, there’s been a profusion of soft-money groups, who do robo-call campaigns. You know, a smear piece on Candidate A done by the Committee for Truth, Justice and the American Way. Say who? You have no idea who’s paying the bill or where these things emanate from. It can get rough. Dorchuck told me he has turned down business where a candidate’s campaign wanted calls made to voters between 2 a.m. and 4 a.m. – and have the message tout his opponent. I will be that there is somewhere someone who took that job. The funeral directors were in town this week. Apparently, their convention is a grave undertaking.
. . . We’re too fat – that is, “heavy-set,” in funereal parlance. “To accommodate the increased size of Americans, we offer Dimensions caskets,” said Kurt Soffer, a Utah funeral director. They’re up to 16 inches wider inside than standard. People in the industry are actually injuring their backs more frequently with increasingly heavier clients. Another difficulty with corpulent corpses: During viewings, it’s hard to keep the hands of fat people lying in their coffins from flopping from their stomachs to their sides, funeral directors said. In many cases, the hands are sewn together. To avoid the big needles and the mess, Milwaukee funeral director Bernard Yonke invented a wristband that uses Velcro to keep hands in place. I guess the old 6×3 pine box is moving towards 6×6.
. . . we have to be confident that George W. Bush is so competent, all-knowing, and inherently just that we can just trust him. If he says someone is an enemy combatant, then he or she is. No need to check with a judge about why he or she is being held. And then Bush can have the suspect tortured to make him confess, and can convict him on the basis of the coerced confession, all in secret. Competent (WMDs), all-knowning (Al Qaeda Determined To Attack in US), trustworthy. We have sold our birthright to fear itself. About the Torture Act. Well said, by the persons we once accused of oppresssing us. Well, we have home-grown oppressors now. It is the most un-American piece of legislation passed since the so-called “Patriot” Act. But it is a “vital tool” in the war on terror, the President insisted, using his stock slogan for all of the administration’s various assaults upon proper judicial process and civil liberties. Massive electronic dragnets and wiretaps are a “vital tool”. Warrantless searches are a “vital tool”. Holding thousands of prisoners in an extra-judicial limbo is a “vital tool”. And here we have another, rubber-stamped by a spineless Republican Congress. “With the bill I’m about to sign, the men our intelligence officials believe orchestrated the murder of nearly 3,000 innocent people will face justice,” the President gushed as he prepared to make the legislation law. Aside: The mouth is hardly a sterile environment. Gilgenbach acknowledged cutting in front of Dierks on Interstate 630 in midtown Little Rock. With a tip to Susie.